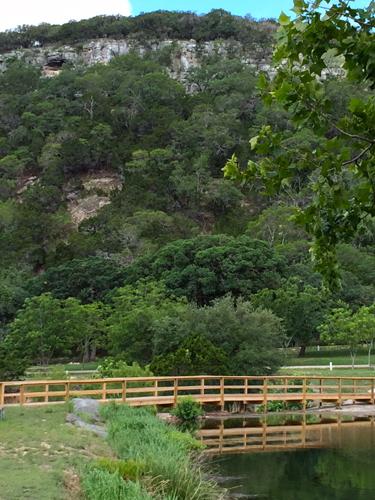 Medina Highpoint Resort is located in the heart of the Texas Hill Country on Robertson Creek, between many natural wonders that provide various outdoor activities. The resort sits on Edwards Plateau and has an elevation of 2,000 feet at its high point, meaning you haven’t truly experienced breathtaking views until you’ve vacationed here. They welcome RV guests with beautiful surroundings and features that allow you to fully enjoy the comfort of your “home on wheels”. All RV sites offer a concrete patio and full hook-ups including 20/30/50 amp power, as well as dedicated side parking for your chase vehicle. The sites are designed with your comfort in mind; they are 40’ wide and pull-thru sites are 90’ long. Back-in and head-in sites are 55’. All sites are spacious, comfortable level sites with a 15’ wide parking area of crushed native granite. They offer unobstructed views of the gorgeous scenery, while still encompassing a degree of privacy not usually found in an RV park. Plus there is no additional pet fee. You won’t want to leave! Located in the heart of the San Joaquin Valley, Flag City RV Resort offers the fine amenities and conveniences that RV travelers enjoy at the highest quality RV resorts, including swimming pool and heated spa, large clubhouse, convenience store, 2.8 acres for picnicking and recreation, and much more! This resort is located just minutes from Lodi Lake and just 5 miles from The Delta, offering over 1000 miles of navigable waterway. Get out on the water and enjoy the best Central California boating, fishing, water skiing, and windsurfing. And, be sure to check out a few of the exciting day trip destinations close by for shopping, dining, golfing, or general site seeing. 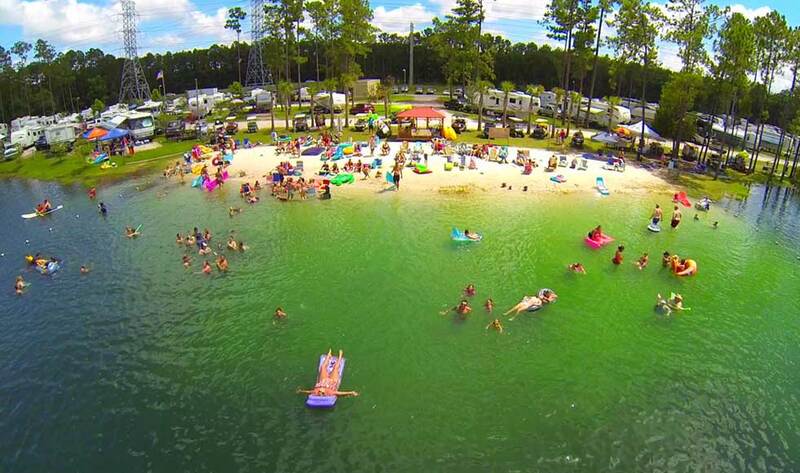 If you’re in the mood for more than a rustic experience, check out Flamingo Lake RV Resort in Jacksonville, Florida. With a 5-Star rating, this resort accommodates most RV sizes, and includes hook ups for not only electric, water, and sewage, but also offers Wi-Fi and cable TV connections! You can enjoy private bathrooms with hot showers and a spa, as well as picnic areas, a pool, private beach and lake swimming, and a pet area for your travelling animal companions. 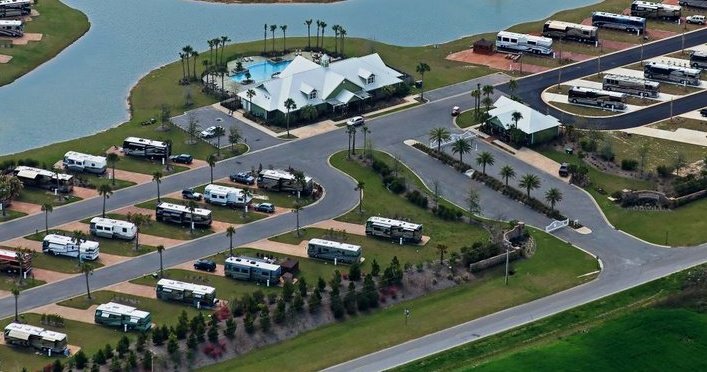 Within just 30 minutes of the main beaches of Jacksonville, the Flamingo Lake RV Resort is a wonderful option for those looking for more than just a place to park for a few days. If you are Georgia-bound, stop at Rivers End Campground and RV Park, located on Tybee Island, just half an hour from historic Savannah, Georgia. Campers will enjoy all of the modern amenities of a great RV park, including laundry services, cable TV, Wi-Fi, and private air-conditioned bathrooms. Pets and children are welcome. Guests can grill out in the covered gazebo or hang out in the game room. 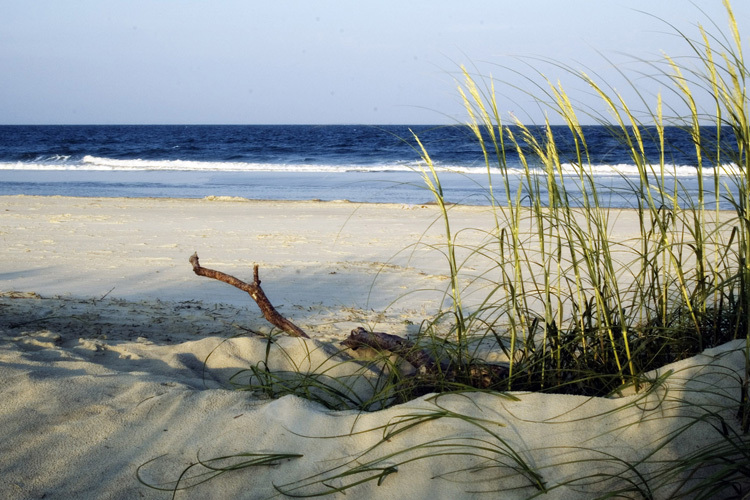 Offering beautiful white coral-bedded sites for snorkeling, the site is just ten minutes from the main beaches of Tybee Island, where guests can enjoy all types of sailing, fishing, surfing, or relaxing their day away. Located near the lush beaches of Gulf Shores, Alabama, Bella Terra Luxury Resort in Foley, Alabama, boasts a 5-star diamond rating. Offering extended stay sites for RV travelers matched with private bathrooms, spa and sauna, swimming pool, fitness rooms, and a hot tub, this resort is purposefully designed for travelers who want to relax for the long haul. It has electric, water, and sewage hook ups, too, making this RV destination ideal for those looking to stay for a while. Pets are allowed to explore and roam leash-free in a pet area, and you can take them with you down to Gulf Shores for snorkeling, swimming, or kayaking. For snowbirds traveling this winter, there are several exciting RV destinations to check out. Many offering wonderful amenities and gorgeous views, there’s never been a better time to head south. Enjoying family time outdoors with pets and friends, meeting other travelers, and exploring local beaches and city life are just some of the exciting reasons to pack up the RV and travel south. I’m very new to this. We have a 16′ travel trailer. We are planning our 1st roadtrip from the East to mid West, not one final destination for the winter. Any helping words of what route to take? Places to stay? Planning to travel from Jan – beginning of April. Or is there a better place to get info? Thanks. Get the AllStays app from the app store. It is incredible for finding places to stay. Thanks. Found it for $9.99. There are 2 apps for free. We are brand new too and we travel with a family of 3 kids any recommendations? We live at 5,000 ft and we have views of multiple 14ers, so yeah, 2,000 sounds a little on the mini size. However, when you’re in low country, 2,000 can seem pretty lofty. Don’t know about the claims for this place for sure, but I think I’d like to see the view before dismissing it.